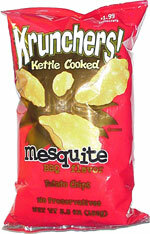 Taste test: Guest reviewer Sean Ford reports: "The Krunchers Kettle Cooked chips are generally thick, crunchy chips, which I enjoy. For some reason, a good number of these chips folded over on themselves, essentially doubling or tripling the crunch ... BONUS! The BBQ flavor was more of the sweet variety rather than the spicy variety, which is too bad, in my opinion. I think the flavor would be enhanced with at least some hint of a spicy bite. The flavoring is added in a powder form and was not overdone, so your fingertips are not coated with a red powder. I never noticed anything woodsy or grilled about the flavor, so I can't say that the Mesquite flavor really comes through. In the end, they're a good crunch, with a leaning towards sweetness in the flavoring. I liked them, but I don't think I'd drive a long distance to try and find them again." From the package: “Krrrrunch!... There's nothing better than a crunchy potato chip, one that lets you hear some attitude when you bite into it. Sliced extra thick, hearty kettle cooked Krunchers!® can stand up to any challenge you give them. 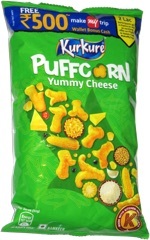 This snack was discovered by Sean Ford at TechTarget headquarters, 117 Kendrick Street, Needham, Massachusetts. Review published .